We have put together a do-it-yourself section in the greenhouse for those of you who enjoy designing your own creations. 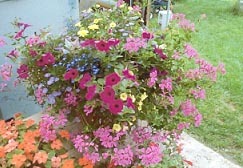 We at Skawski Farms put together many colorful planters such as the one seen on this page. We sell them in a variety of containers in many shapes and sizes. All of the plants are sold individually on our farm and you can put together your own creations to match planters you buy here. You can plant your own theme of flowers based on combinations that we help you create. This might include creating your own window boxes, garden styles, whiskey barrels, hanging baskets, or whatever else your imagination might dream up. We have a giant selection of flowers in individual pots that include sun plants, shade plants, flowering plants, foliage plants, and trailing plants. We also offer Ivy Geraniums, Upright Fuchsias, and many more. If you are interested in designing your own projects this is the place to come for ideas and materials. Many of these plants are available in 4” pots. If you are looking to spruce up the yard for a party or just want to add a new pot to the pool area, we will have something for you. 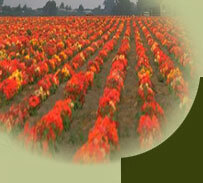 These plants provide an instant show of color our customers enjoy which makes them popular at the farm. The following are just a few of the many plants we offer.